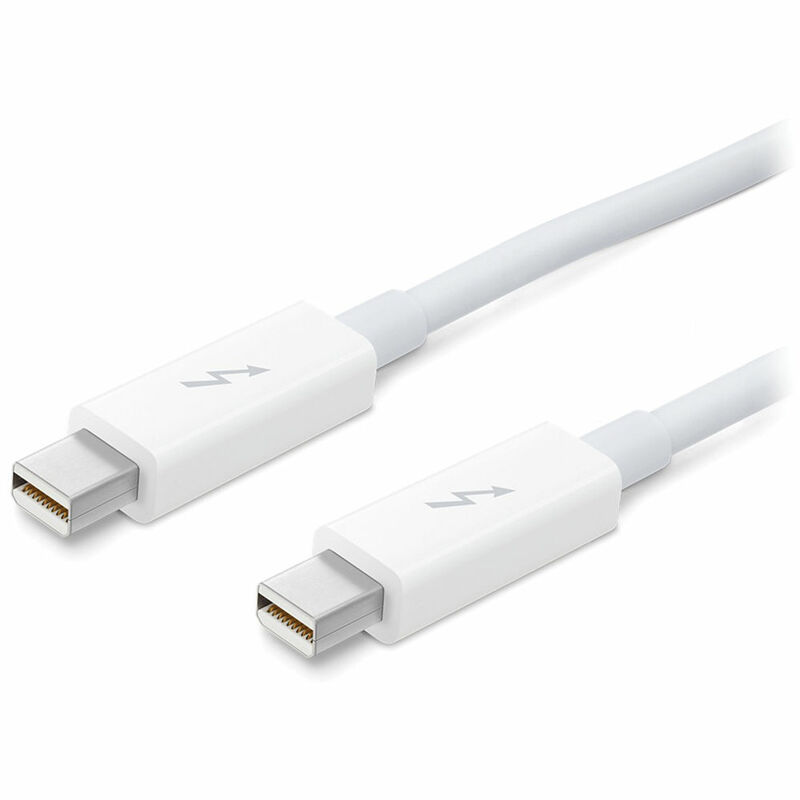 6.6' (2.0 m) Thunderbolt Cable (White) is rated 4.9 out of 5 by 42. Rated 5 out of 5 by Scott L from Not All Thunderbolt Cables Are Made Alike! I ordered this 6' Thunderbolt cable from B&H and it came very quickly and worked PERFECTLY in my MacBook Pro! Note that I had originally purchased a 6' Thunderbolt cable from a local store. To his credit, the salesperson said he wasn't sure it would work on an Apple Macintosh. He was correct, as that third party cable didn't fit correctly and wouldn't pass signal! (Wasted several days of my time needing to sync up some audio gear for a recording. I should have purchased it from B&H in the first place.) Thanks, once again, B&H. Everything I've purchased from you guys over the years has been great! Rated 5 out of 5 by J M from 2 meter Thunderbolt to Thunderbolt (male to male) Well, it's an Apple product so it's well made and works perfectly connecting an iMac to a Thunderbolt display. It's long enough to make the connection possible without overlapping screens. The service from B&H was excellent as usual, packed well, arrived in good time, and in good condition. The cable is difficult to find, and I think Apple itself has discontinued it from Apple Store stock. Good for B&H as reliable source . Rated 5 out of 5 by Charles from Not a lot of options for long Thunderbolt Cables Would love a longer, more reasonably priced Thunderbolt cable, but 6.6' works well enough for us, and at a reasonable cost. Rated 5 out of 5 by Roger from Does the Job Wired an external hard drive, worked great. No problems. Rated 5 out of 5 by Camper 399 from Great Product Wanted an easy & fast way to transfer a huge file of pictures, that I took on vacation and put on my laptop, and move them to my desktop. What would have taken a very long time any other way but was lightning fast with the Thunderbolt Cable. I really didn't know how to do this but apple helped me and I was amazed. Very glad that I purchased this product. Rated 5 out of 5 by Lou C. from Works as described I ordered this Thunderbolt cable because I thought the Pegasus 2 R2 storage array didn't have a cable included. The Pegasus DID come with a thunderbolt cable was it was half the length of this cable. I am glad I ordered this cable as I do not have the room on my desk for the Promise HD array and now I can store it under the desk. Rated 5 out of 5 by noiseman from Typical solid build by a great company, albeit expensive- This cable works well as intended. Used to transfer digital info to and from an audio/midi interface...no hang ups, yet! Typical pleasant form factor and build one expects from Apple. White color is easier to see in darker lighting. Sticker shock is the only negative. Rated 5 out of 5 by Jim Mac from Works as designed I purchased a pair of the 2M Thunderbolt cables, to provide connectivity to my new Thunder2 Duo Pro. The Apple cables are sturdy and well made. The connectors are sturdy, so that the cable will not easily get bent at the connecting point. This would depend on your peripheral and computer. If you are not entirely sure, please refer to the user manual of your devices. Can I use this cable with any computer, laptop, or it has to be an Apple computer only? Any computer with a Thunderbolt 1 or 2 port but they are not common outside of Apple computers. Check to make sure that your device actually has a Thunderbolt 1 or 2 (not Thunderbolt 3, that's a USB-C type connector) before you buy it.